Tournament organiser Grosvenor Casinos revealed that the main event field for this year’s Goliath, which took place at the Grosvenor Casino Coventry inside the Midlands city’s Ricoh Arena, numbered 1,000 more than in 2015 and was eventually topped by London native Vamshi Vandanapu following a three-way deal. 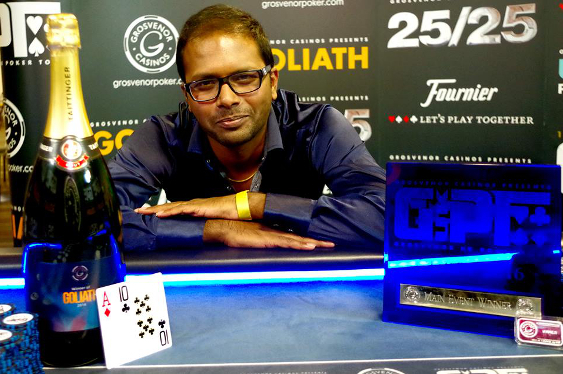 “A huge congratulations to Londoner Vamshi Vandanapu for finishing on top and earning £62,750 and taking home the much coveted trophy,” read a statement from Grosvenor Casinos. At just before eight o’clock in the evening on Sunday, the remaining three Goliath main event players agreed a deal that saw each secure £50,000 ($65,027) while leaving £12,750 ($16,582) on the table for which to play. When the dust settled, 44-year-old Irishman Robbie Richwood finished as the runner-up while 33-year-old Romania-born Cristian Popescu was third. Both left the Ricoh Arena £50,000 better off, which was a substantial improvement on their original investment of £120 ($156). “I never imagined I’d be the remaining one [and] I just played it one hand at a time,” said Vamshi. The final table additionally showcased the huge diversity of players who attend these events and included 44-year-old Birmingham teacher William Campbell, who finished in fourth spot for £27,000 ($35,114), as well as fifth-placed Tom Powell, a 21-year-old bartender who recently became a father and is now richer to the tune of £18,850 ($24,515). Thirty-three-year-old Graeme Evans from Horsham ended the night in sixth spot and now plans to use some of his £13,400 ($17,427) prize for a deposit on a new home. There was £10,450 ($13,590) in cash for professional poker player Luke Winsley after he finished in seventh while Sheffield student Craig Drew collected £8,600 ($11,184) for eighth. “Every year, Grosvenor Casinos strives to put together an unparalleled week of poker festivities offering top-class entertainment as well as the best tournament and cash poker Europe has to offer,” read the statement from Grosvenor Casinos.